If you’re looking to buy shoes then you are in the right place, because here you’ll find the best shoe deals, including coupons & promo codes from major retailers. Browse the current shoe sales, discounts & promotions for sandals, boots, flats, wedges, running shoes, boat shoes, oxfords, loafers, and more, from popular shoe brands. Whether you’re looking for casual, work, athletic, walking or fashion shoes, you’ll find great deals here. Don’t miss the latest sales and use printable coupons or digital coupons, to pay the lowest price. – Save up to an Extra 20% OFF during Mother’s Day Sale + Free Standard Shipping on $99+. Use Promo Code: MOM. – Save up to 75% OFF New Shoe Markdowns. – Save up to an Extra 20% OFF Select Sale Items. Get an Extra 20% Off Clothing & Accessories, Jewelry, Home Items & Watches + Extra 15% OFF Shoes, Coats, Suits, Dresses, Lingerie & Swim For Her + Extra 10% Off Small Appliances. Use Your Macy’s Card Or This Pass. Savings Off Select Sale Items In Store. – Save $10 OFF Select Mother’s Day gift Purchases of $50+. Use Promo Code: MOMSDAY10. Limit one coupon per customer. – Save $10 OFF Nike Athletic Shoes for women. No Promo Code Required. – 25% OFF Adidas Sale – Adidas clothing and shoes for the family. Select Styles. Ends May 20. – 25% OFF Converse Shoe Sale – Converse shoes for the family. Select Styles. Ends May 20. – Save $10 off $25+ In-Store and Online. $10 off select apparel, shoes, accessories, fine jewelry and home purchases of $25 or more. – Save an extra 15% OFF Your Order. Coupon Code: RMN15. One use per coupon, One coupon Per Customer. – Save $10 OFF your Order when you sign up for emails. – Save $20 OFF $49+ Select Items for Rewards members. Use Promo Code: 483376302006. 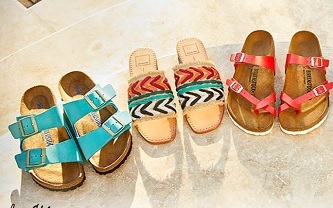 – Save up to 70% OFF Select Women’s Sandals. Limited time only. – Free Workout Tote & Yoga Mat With Your $29 Purchase. Add the Workout Tote item number 382191 to your shopping bag along with your purchase of $29 or more, then add offer code: FREEYOGATOTE. Limit one per customer. Offer valid for rewards member only. – 20% OFF for participating brands. Use Promo Code: MAY18. Not valid on purchases of gift certificates. Not valid on previously purchased items. Free Shipping. No Minimum. – 30% OFF your purchase + Free shipping. Use Promo Code: HELLOCLIPPER418. – 30% Off Sitewide + Free Shipping & Returns. Use Promo Code: HELLOMONEY318B. – Get a $10 Reward when you spend $75 or get a $25 Reward when you spend $150. Limit one Reward per customer. – Save Extra 25% Off Storewide. Use Promo Code: 251610690. Limit one coupon per customer. – Save 20% OFF your online order. Use Promo Code: ZZSTYLE20. – Save an Extra 20% OFF Storewide. Use Promo Code: 251610577. Limit one coupon per customer. Valid in U.S. and Puerto Rico locations only. – Save $5 OFF $50 Apparel, Shoes & Accessories. No Promo Code Required. – Buy One, Get One 50% Off + Free Shipping on $50+. – Up to 70% OFF Clearance. – Save $10 on $75+ orders or $25 on $150+ orders. – $5 OFF your order of $25 when you sign up for email. – Up to 50% OFF for Athletic brands. – Buy 1, Get 1 50% OFF and also get Extra $5 OFF when you spend $39.98 or more or Extra $10 OFF when you spend $59.98 or more. Use Promo Code: MOMSDAY. – Up to 50% OFF Select Women’s Shoes in clearance. – Get a $10 reward certificate for every 200 Shoe Perks points, $1 spend = 1 point. – Save 20% OFF all Men, women and kids categories. Use Promo Code: SPRING20. – 10% OFF Your Order. Use Promo Code: WELCOME. – Extra 30% OFF for select Men’s & Women’s Footwear. – Extra 20% OFF for Select Sale Styles. Use Online Promo Code: 20SPRING. Some Exclusions Apply. – Take 10% OFF for Students. No Promo Code Required. – Up to 40% OFF select sale styles. – Take 10% OFF for orders of $50 or more, online only. Use Promo Code: LKS185MA. – Take 15% OFF for orders of $75 or more, online only. Use Promo Code: LKS185T2. – Take 20% OFF for orders of $120 or more, online only. Use Promo Code: LKS185T3. – Free Shipping on orders Over $75. Use Promo Code: LKS185T4. – Take 20% OFF Select Shoes. – Take an extra 15% OFF your order in-store or online. – $5 Off $25 Online or In Store With Email Sign Up. You will receive an email with your $5 Off $25 promo code after sign-up that can be used in-store or online. – Up to 30% OFF top trending women’s sandals. – 15% OFF sitewide + Free Shipping Over $75 or Free Ship to Store. Use Promo Code: MAKEHERDAY8. – Up to 50% OFF Women’s Dress Sandals.